I hope that you’ve had a restful and productive summer despite the terrible air quality we’ve been experiencing for the last month. Please attend the TRUFA Welcome Back BBQ on Friday, September 14thand meet your new TRUFA Executive. If you are a new TRU faculty member, please make a point of saying hello to me at the BBQ. TRUFA will be organizing an event later in the fall semester for newly hired faculty. Please monitor the trufa.ca website and your inbox with messages to TRUFA-L.
FPSE will budget $25,000 for an ongoing campaign promoting “Whose Land Is It Anyway? A Manual for Decolonization” and will have both the BC Federation of Labour and the Canadian Labour Congress contribute to the printing and promotion of the volume and its translation into French. TRUFA’s FPSE staff rep, Weldon Cowan, presented an overview of the legal status of Canada’s trade unions and provided important context for the responsibilities of elected Executive members. 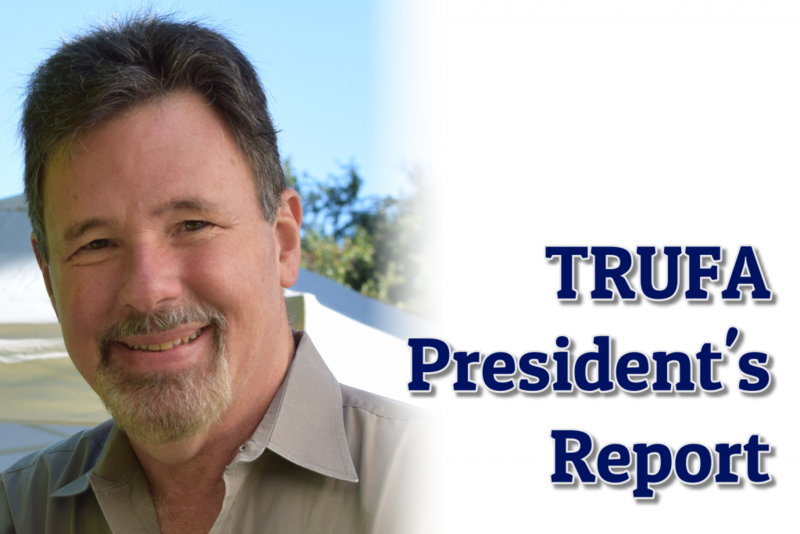 Members—particularly members new to the Executive Board—were briefed on the internal structure of TRUFA, including the composition of the Executive, standing committees, TRUFA representatives to FPSE committees and TRUFA Table Officers. Having received legal advice that allegations of harassment by faculty members in the context of union activities must be investigated and adjudicated by the union, not by the employer, TRUFA drafted an internal harassment policy. The policy was formally endorsed by the Executive. I reviewed the mechanisms by which TRUFA works with other bodies within the University context. Chief among these is the TRU/TRUFA Labour Management Consultative Committee, which is mandated by the BC Labour Code. In relation to the labour movement, I explained TRUFA’s affiliation with FPSE, the Kamloops & District Labour Council, the BC Federation of Labour and the Canadian Labour Congress (through the National Union of CAUT). In connection to the academic community, I reviewed TRUFA’s relationship with the Confederation of University Faculty Associations of BC (CUFA-BC) and the Canadian Association of University Teachers (CAUT). Most of the strategic planning focused on bargaining. Our current collective agreement expires on March 31, 2019 and much of TRUFA’s efforts will be on negotiating a new agreement. The Vice President of the Salary and Working Conditions Committee (SWCC), Lloyd Bennett, and other SWCC members will continue their consultations with TRU faculty on bargaining priorities during the fall semester. The TRUFA Communications Committee will continue to promote TRUFA and its work both internally (at TRU Back-to-School BBQ on September 7th) and externally (at the August 26thPride Kamloops Parade and at the September 3rdLabour Council Labour Day Picnic), as well as at other events on campus, such as the TRUSU Clubs Day. Both Open the Doors and Fair Funding campaigns have scaled down, but TRUFA will participate with FPSE’s lobby of the government and opposition MLAs in Victoria in October. As we begin the Fall semester and embark on enhanced preparation for contract negotiations, I urge you to keep informed about TRUFA events and issues. The main source of information will be our trufa.ca website. Most of the information (including the TRU/TRUFA collective agreement, the TRUFA constitution and by-laws, Faculty Handbooks, benefits information, tenure/promotion information) is currently available without logging in. However, every TRUFA member will be issued log-in and password for the “Members Only” sections of the website, in which all bargaining updates will be posted. In addition to the website, TRUFA will keep you informed through e-mails directly to your inboxes via TRUFA-L. 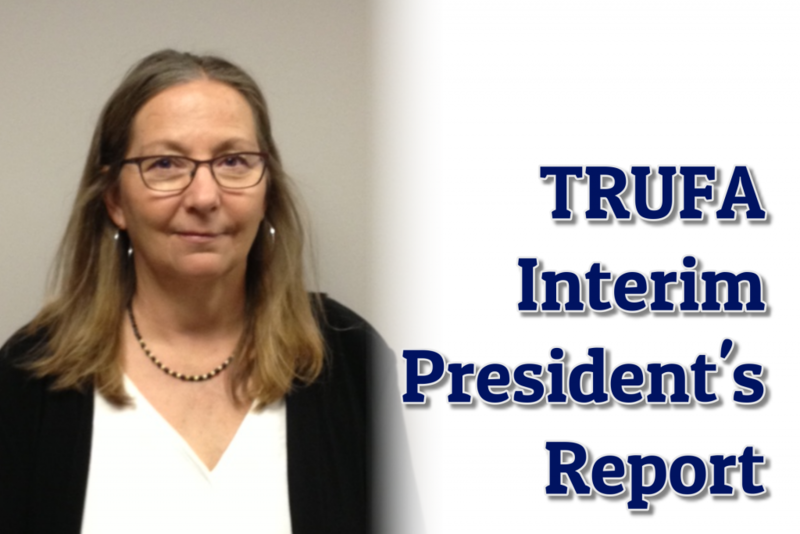 If you see an e-mail either from “TRUFA President” or “Marian Griffin”—our TRUFA confidential administrative assistant—please recognize that it’s important and deserves to be read. All the best as you start the Fall 2018 semester.